The expert Hollywood celebs get their skin health advice from Kate Somerville. COME EMMY AND OSCAR TIME, Kate Somerville is a ﬁxture in Hollywood, and is best known for making famous faces camera ready for the their close-up. These faces include those of Debra Messing, Julia Louis-Dreyfus, Kate Walsh and Jennifer Coolidge among many others. Her lavish salon, meanwhile, is a gloriously appointed two-storey nod to old Hollywood that’s open year-round. 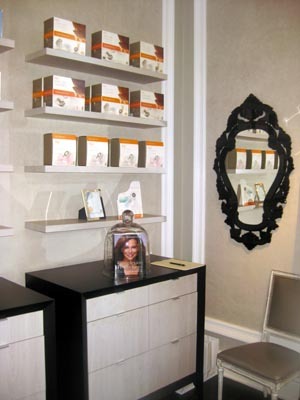 The fact that she’s in the business of keeping her chic clientèle looking young puts the spa’s surroundings in an interesting context. 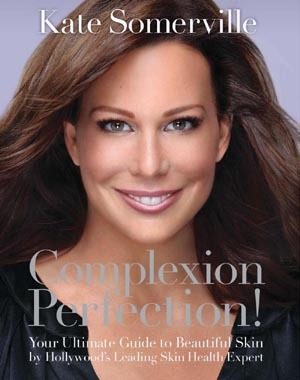 She is now setting her sights on bringing that message everywhere else, via her newly published book Complexion Perfection! (Hay House, US$27·95 or £18·54), prepping special value packs for the holidays and releasing several new products that make the beneﬁts of her day spa accessible, and her advice in the book easy to follow. What makes Complexion Perfection! refreshing is that Somerville features non-celebrity models aged from 30 to 70-something, keeping name-dropping to a minimum in favour of advice that goes beyond face value and into other areas like exercise, nutritious foods, hair and wardrobe advice (via her assembled ‘Glam Squad’). The book also features a FAQ section that is handy and interesting. New products lining her glamorous Melrose Place shelves, as well as those at Neiman–Marcus, Sephora, QVC.com and other retailers outside LA, include a weightless SPF 55 Serum Tinted Sunscreen, CytoCell Dermal Energizing Treatment (with P-199, a new synthetic polypeptide designed to reboot the skin’s metabolism), a fast-absorbing Neck Tissue Repair Cream that’s not the one your Mom or grandmother used, and a Complexion Correction line with a vitamin C base that reduces the appearance of age spots and other annoyances.